As the NASA Curiosity rover touched down gently on Mars and began its 2+ year observation and exploration of its surrounding terrain, the NASA Goddard Institute of Space Studies announced the publication of a new paper in the journal Proceedings of the National Academy of Sciences. I reported on a pre-publication release of this paper back in April and was able to reproduce a much simpler version of the analysis using New York Central Park data in a more recent posting. As demonstrated by Curiosity, NASA is a formidable science based organization and one whose findings should not be taken lightly. An early version of the paper appeared back in March, before the extended heat wave experienced in the USA through most of July. As it turns out, July has been confirmed as the single hottest month ever recorded in the continental United States. The average temperature across the Lower 48 was 77.6 °F, 3.3 degrees above the 20th-century average, the National Oceanic and Atmospheric Administration (NOAA) reported. That edged out the previous high mark, set in 1936, by two-tenths of a degree, NOAA said. In addition, the seven months of 2012 to date are the warmest of any year on record and were drier than average as well, NOAA said. U.S. forecasters started keeping records in 1895. Some of course will question the validity of the data used by NASA GISS, but just days before their announcement came a second release of findings from the Berkeley Earth Surface Temperature project. They found that the average temperature of the Earth’s land has risen by 1.5 °C over the past 250 years. 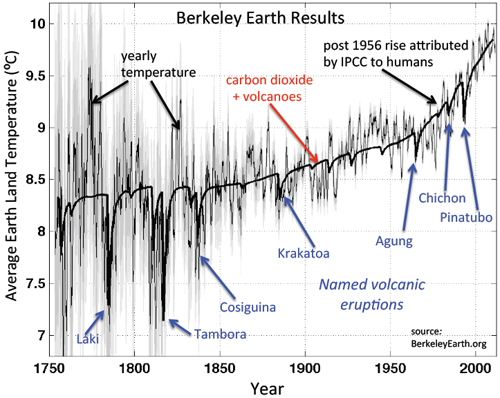 The Berkeley study noted that the good match between the temperature record and historical carbon dioxide suggests that the most straightforward explanation for this warming is human greenhouse gas emissions. One of their key charts is shown below. While the analysis from NASA and the data validation from Berkeley will still not satisfy everyone, they will hopefully begin to put to rest the ongoing science controversy that seems to hamper any rational thought about the best approach to actually addressing the issue of rising levels of atmospheric CO2. Since the creation of the UNFCCC 20 years ago after the first Earth Summit, many have lost hope that a multilateral approach can achieve anything, particularly after the setback of Copenhagen (another attempt plagued by science and temperature controversy just as world leaders gathered) and the eventual failure of that process to agree anything substantive in terms of mitigation efforts for the period 2013-2020. Yet it will ultimately only be such a multilateral approach that can eventually tackle the problem of global emissions – not necessarily to dictate to the world how to do it, but to at least set the direction and timetable for what will ultimately be a bottom up approach. No one country, region or industrial sector can solve this unilaterally. 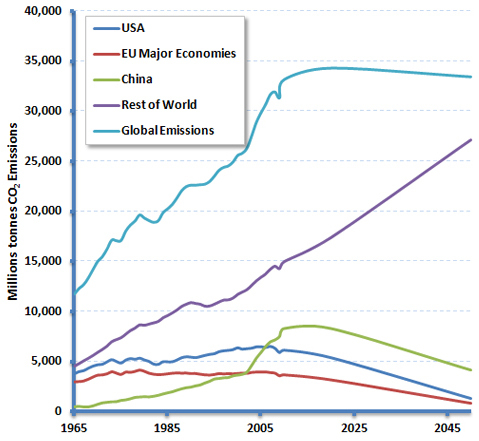 Even if the big three, China, the USA and the major EU economies acted alone (with China reaching a plateau in the short term and then reducing by 50% by 2050 and the US and EU reducing by 80% by 2050), global emissions would plateau at best (see chart below) assuming that the rest of the world emissions grew by no more than 1.5% per annum over the next 40 years (in fact they have been growing at well over 2% p.a. over recent decades). So this issue needs a response from all nations. As the agreement at COP 17 in Durban “to try once again” gains momentum and turns into a full negotiation process it will be important to lay down foundations that might actually deliver a workable outcome. This is a subject that I hope to revisit in a number of posting between now and the end of the year. How important is the two degree target? Some different perspective on NASA GISS PNAS and July data. It is very bad case of disinformation from David. GISS is led by activist Hansen and it has nothing to do with JPL which is managing MSL rover. Quite opposite, many key people in NASA are opposed to the bad science coming from GISS and especially from the political activist directing GISS. Also Muller – head of BEST overshoot his statement. He has difficulty with peer – review his work as his statements are way beyond his work. Even some of his co-workers are turning against him. July as a warmest month in US seems to be bogus. It is a shame that some people just try to do anything to promote their agenda. I would recommend any scientific advisor to spend more time investigating facts and less PR press reading. I would recommend climate science advisor and fan of Hansen and his GISS to read following article. 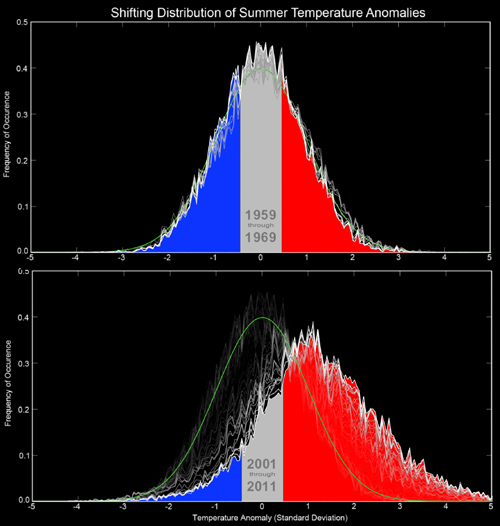 Is GISS global temperature reconstruction suitable for scientific research? It is outlier even between other land based measurements (which are still quite inaccurate). Perhaps Hansen should spend more time on quality control rather than doing political activism.